Enter the title or question for your Poll. Note: You'll initially see just 3 "Choice" boxes. When you start to enter data in the 3rd choice box, you'll be given a 4th box. And when you start to enter data in the 4th box, you'll be given a 5th box, etc. You can have up to 25 choices defined. Next, choose how you want the results to be displayed to your audience, in a pie chart or bar chart. When you have more than 4 choices for users to pick, we recommend a bar chart format. Next, decide if you want the attendees to choose just one answer or mark all that apply. Last, choose whether you want your audience to be able to view the results to the poll on their own device after they respond, or not. Note: New Polls will be Locked by default after you create them. When a Poll is Locked it will not be visible to the Audience. To Unlock a Poll, click the Lock icon on the right side of the Poll. Once a Poll is Unlocked it will become visible to your audience. 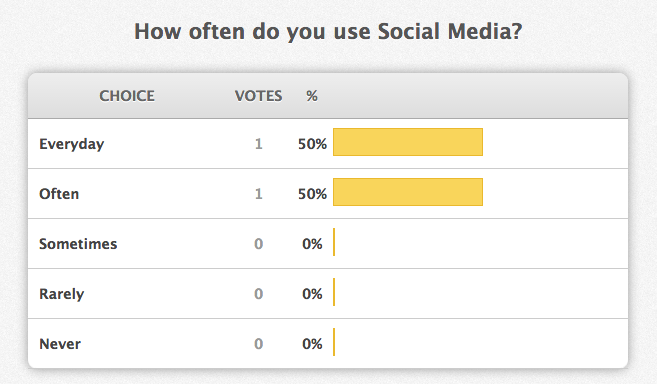 Audience members can then click on the Poll to respond to it. Note: Typically, you won't manually lock/unlock poll questions when you are actually conducting live polling. By using either our PowerPoint integration or our browse-based Presentation mode, your poll questions will be automatically unlocked at the appropriate time, and the question will be pushed to your attendee's mobile device screens for a response.